GRAFENWOEHR, Germany — Parents can prepare for the 2018-2019 school year with a back-to-school celebration at the Tower Barracks Main Exchange Aug. 17 from 10:30 a.m. to 1:30 p.m. 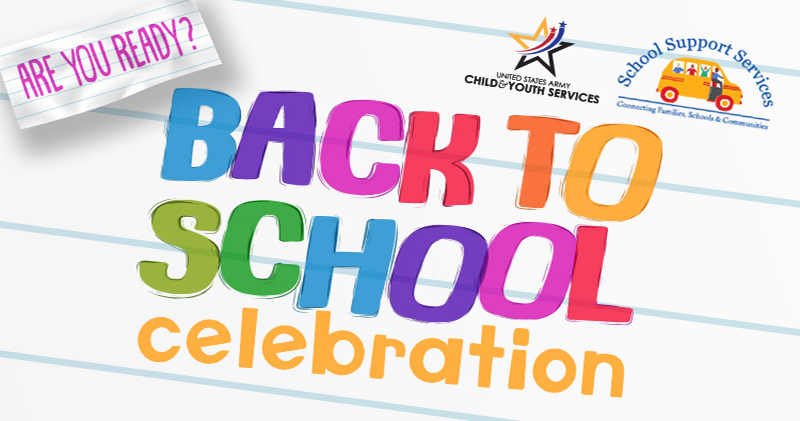 The celebration will assist parents and students of all ages as they get ready for the new school year at Netzaberg Elementary and Middle schools, Grafenwoehr Elementary School, and Vilseck Elementary and High schools. Attendees will be able to register for the school meal program and free and reduced meals, child and youth services sports and activities, girl scouts, boy scouts and other community programs. Child and Youth Services will provide information on programs and care, and hold registrations for dance, soccer and other fall and winter youth activities. Organizations such as the Parent Teacher School Associations, library, American Red Cross, USO and Education Center will have information tables set up. Some vendors will even have school swag on hand to include pencils, rulers, notebooks and backpacks. Parents will also be able to participate in a school bus tour, which will highlight school bus safety and force protection measures. The school bus tours take place at 11 a.m. and 12:30 p.m. But it’s not all serious. The event will have fun and games to include face painting, a selfie station, a cake cutting at 11:30 a.m., and raffles for a vacation at Edelweiss Lodge and Resort. The Fire Department will also have a fire truck set up as a static display. The event is hosted by the Directorate of Family, Morale, Welfare and Recreation, the Exchange, and the Department of Defense Education Activity-Europe, and organized by the school liaison officer. Can’t make the Aug. 17 event? The School Liaison Office has all the information you need on registration, calendars and school events. In addition to the back-to-school celebration, don’t miss the last large family event before school starts. Join the United Services Organization and MWR for the Sun & Fun Day Aug. 25 from 12 to 4 p.m. at Wild B.O.A.R Outdoor Recreation. This community event will be loaded with music, face painting, games, prizes and barbecue, along with the ropes course and a dunk tank.